This objective flips the game on its side, literally. Instead of the regular 4'x3' setup area on the 6'x3' play space, you have the whole of the board as the setup area, and you are playing on the map long-ways. The deployment zone for each side is huge, with 2 ruler lengths (2'x3' deployment zone). First Player is set up to destroy enemy ships as they come, while Second Player scores by having ships still alive, and in the enemy's deployment zone. Second Player: This is designed for lists with hard to kill ships that are fast enough to escape to the other side. Bonus if they can kill something while they make their run. Each of your ships is valuable, and worth an extra 20 points to the enemy if destroyed. Consider a Mon Mothma or Cracken fleet making a run extra defensive, with MC-30s, AFIIs, or MC80 Liberties. Jaina's Light and other corvettes have the speed to run blockades, but lack the staying power of the MC-30s if they run into a bad matchup. You could go the opposite direction of hard to kill ships and run a ton of ships hoping to overwhelm the enemy - an 18 point transport is worth 20 points at the end of the game if you get it all the way to the end - but that is a high risk proposition. A third thought is a list that can hit really hard and go fast, swatting defenders away and picking up bonuses for your own fleet making the run. ISDs, Gladiators, MC30s, and Liberties fall into this category, being able to put out a ton of damage and then scoot away at speed 3 or better. First Player: Your opponent is incentivised not to stay and fight. They are going to go fast, get around you, and run for the hills if they can. So, you want to keep them from running, right? 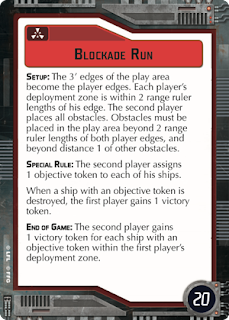 Konstantine might be a more popular Commander if this objective starts seeing widespread use, likewise Interdictors with their various bag of speed tricks, Tractor Beams, and Tidus might help make the run a little more difficult for the second player. Being able to reliably intercept and destroy enemy ships on the approach is important as well, so you want agile but heavy hitters like MC30s or Gladiators. ISDs and MC80 Liberties also have a decent turning radius, and MC80 Home Ones with their broadsides can catch an enemy ship both coming and going, if they turn perpendicular to the board. Overall Strategy: Nebulon B's can actually use the smaller width of the fight to their advantage, cutting off a potential flank, either on offense or defense. Squadrons can be used as a spear point to try and crack through a point of the blockade, or done away for the most part with fast enough ships. Clonisher type builds could see this as a real opportunity to feast on enemy ships as First Player. Realistically, a spread of ships types and strategies could see success on either side of the board here, it will be interesting to see what, if anything, is done with this objective. Close-Range maybe a bit of a misnomer, as I think the best options for making this work is pinging someone at long-range with H-9 Turbolasers or Sensor Teams, collecting points on the approach at a range that most enemies would be evading anyway. Also, Dust Clouds are added, giving more obstacles (not to mention the ability to hide behind one and be impossible to shoot). Second Player: This is an easy objective to build for currently, as everyone and their kid brother are taking H-9 Turbolasers (or Sensor Teams) to have a chance at hitting enemy flotillas. Now you can turn that into points if you don't otherwise need the accuracy. Or just keep the accuracy if you are able to swat something out of the sky. It is not a Rieekan objective, per-se, but it is much harder to use as First Player than Second Player, so you might even consider it for a Rieekan list. It is a great objective if you think you'll be playing against someone with Electronic Countermeasures and not have a good use for your accuracies anyways. 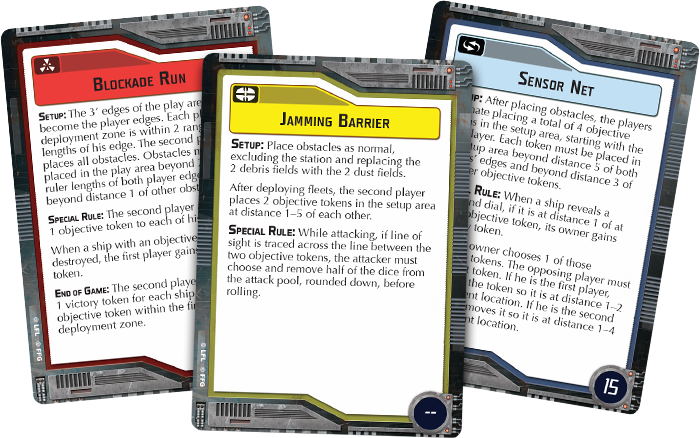 For your ships, redundant tokens can help force your opponents into difficult decisions if they do get two accuracy tokens - turn it into points or actually block your ship's best token. Did someone say Jonus and Gozanti Assault Cruisers? First Player: The best thought I have is taking this objective if you have some reason that your opponent would want to have those accuracies besides scoring points. 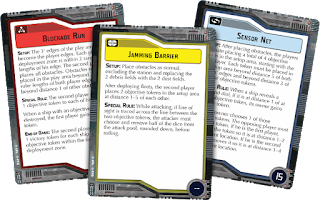 Give your opponent a choice of blocking your ISD1's brace, or scoring those bonus points. Hope they chose wrong. Or if you have some horrific list based around Quad Turbolaser Batteries... but that is a lot of points to invest just to mess with this objective. With the less accuracies flying around, Tagge might have a chance to shine? Cracken actually is pretty hilarious with this objective, especially if your opponent was expecting a single Red die to farm points. Seems pretty obvious, right? Get those Accuracy Results! GSD1s need not apply. Squadrons aren't particularly improved by this objective. GR-75s might as well not be around. An important thing to remember with this game is that the stations are not really 40 points, they are an 80 point swing each from Second Player to First Player when destroyed. Also, just one being destroyed is the break even point. Interestingly, I've played this sort of objective before, kind of. Back in the Wave 1 days, I played a game, with 4 other players, where the Imperials had to defend 3 space stations on a 9'x3' mat against a Rebel attack. The Imperials destroyed far more points than the Rebels, but ultimately lost because the Rebels were so successful at destroying the stations. 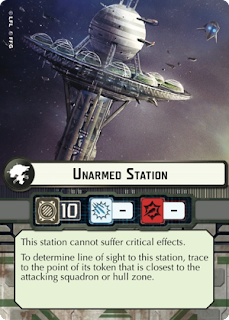 Second Player: Make the most of the station. It is 10 hull worth of shots that your ships hopefully won't be taking while you can focus fire on the enemy ships. Try splitting the stations so that your opponent has to choose which one to deal with, or split their forces to try and grab both. If you have a list that can split up well, you've got a good shot and doing some good work here. Deployment Advantage is going to be very important to this objective. See where your opponent is going to place their fleet, then get the best matchups you can. Use that extra 10 hull to your best advantage. 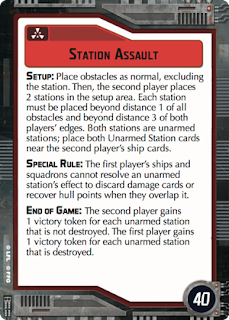 First Player: Come in with a plan: How can you do 10 damage to the station with a minimum of fuss. Don't waste your shots pouring extra damage on later attacks that could hit ships. You want to at least clear one station for the break even point, but two for the 80 points in your favor would be excellent. The Interdictor can pull obstacles closer to you. Like the stations. Don't forget that your squadrons can really put a good work on the stations. 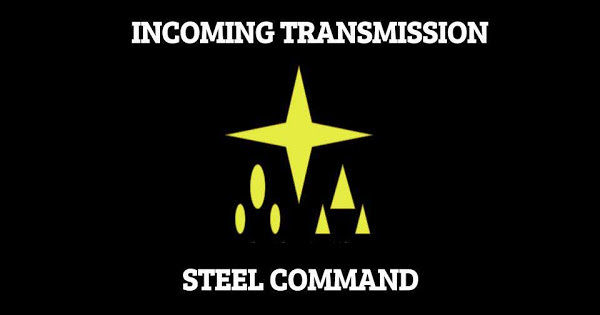 If your opponent splits the stations, a few bombers can chew through 10 hull without commands if left unmolested. The stations don't have defensive tokens either, so a big dice attack is one of the best ways to open up on it. Overall Strategy: Another very asymmetrical game. Keep an eye on the points - know what you need to destroy, or not have be destroyed, to win and plan your moves accordingly. Is there something I'm not seeing here? This looks like a version of Minefields, if Minefields had 4 less mines. The players alternate placing tokens, but only Second Player gets a benefit, and only if the First Player is at distance 1-2 of a token. So why won't First Player place his 2 tokens in like the farthest corners where he will never be? So that is 2 tokens that matter. Before deployment. I... don't even feel like covering this. I guess if you just really, really hate every other Red Objective you could pick this one as Second Player. As First Player, there's not a lot that this objective does to hurt you. So pick it I guess? Overall Strategy: Get ready to never see this objective in a competitive game, ever. Is there something I'm missing here? Q - help me out! 1 - Can be used as a trap because it's a RED that someone WOULD take. 2 - Reading the card, you could overlap or place two objectives next to each other (but that's a 4-dice reroll in that kill zone... it's "farthest" but it does exist). 3 - I would say that's it's better than Minefields because it doesn't hurt Player 2 and it's effectively giving Vader power to red dice fleets. If you can get the other player to play on a 3'x3', it's significant. 4 - You can forgo dice rerolling upgrades - again, hopefully YELLOW/BLUE are so good that you are planning on playing RED. 5 - I think the Interdictor may be useful with this with Titus and the obstacle moving Grav Well. I don't think you can re roll 4 dice. The condition for re roll is for the target to be at 1-2 of at least one tocken not for each tocken at distance 1-2. However this objective should be working nicely with a red die fleet (Ackbar MK2) because only two tocken is enough to cover most of the centre of the board and give you a cunning edge in the red distance where the dice are more random and the re roll less effectives. And don't forget the next wave squadron with their strategic keyword that will let you move objectives tocken. WWPD Steven - Konstantine vs Rieekan Livestream!